LatinaLista — Today, the Senate began debate on immigration, an issue that the majority of the Latino community has been fighting for since the 21st Century began more than a decade ago. 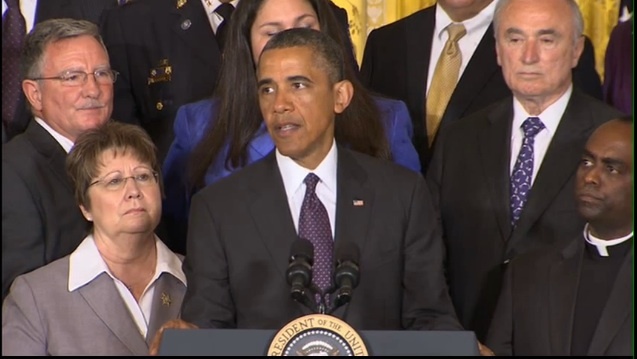 Yet, before the Senate voted to take the bill to the floor for debate, President Obama addressed a distinguished group of businesspeople, law enforcement officers, politicians, advocates — mostly Latino and all in favor of passing immigration reform. THE PRESIDENT: Good morning, everybody. Welcome to the White House. It is a pleasure to have so many distinguished Americans today from so many different walks of life. We’ve got Democrats and Republicans; we’ve got labor and business leaders up on stage; we have law enforcement and clergy — Americans who don’t see eye-to-eye on every issue, in fact, in some cases, don’t see eye-to-eye on just about any issue — (laughter) — but who are today standing united in support of the legislation that is front and center in Congress this week — a bipartisan bill to fix our broken immigration system. And I have to say — please give Tolu another round of applause. (Applause.) It takes a lot of courage to do what Tolu did — to step out of the shadows, to share her story, and to hope that, despite the risks, she could make a difference. But Tolu I think is representative of so many DREAMers out there who have worked so hard — and I’ve had a chance to meet so many of them who’ve been willing to give a face to the undocumented and have inspired a movement across America. And with each step, they’ve reminded us — time and again — what this debate is all about. This is not an abstract debate. This is about incredible young people who understand themselves to be Americans, who have done everything right but have still been hampered in achieving their American Dream. And they remind us that we’re a nation of immigrants. Throughout our history, the promise we found in those who come from every corner of the globe has always been one of our greatest strengths. It’s kept our workforce vibrant and dynamic. It’s kept our businesses on the cutting edge. It’s helped build the greatest economic engine that the world has ever known. When I speak to other world leaders, one of the biggest advantages we have economically is our demographics. We’re constantly replenishing ourselves with talent from across the globe. No other country can match that history. And what was true years ago is still true today — who’s beeping over there? (Laughter.) You’re feeling kind of self-conscious, aren’t you? (Laughter.) It’s okay. In recent years, one in four of America’s new small business owners were immigrants. One in four high-tech startups in America were founded by immigrants. Forty percent of Fortune 500 companies were started by a first- or second-generation American. Think about that — almost half of the Fortune 500 companies when they were started were started by first- or second-generation immigrants. So immigration isn’t just part of our national character. It is a driving force in our economy that creates jobs and prosperity for all of our citizens. Now, here’s the thing. Over the past two decades, our immigration system hasn’t kept pace with changing times and hasn’t matched up with our most cherished values. Right now, our immigration system invites the best and the brightest from all over the world to come and study at our top universities, and then once they finish — once they’ve gotten the training they need to build a new invention or create a new business — our system too often tells them to go back home so that other countries can reap the benefits, the new jobs, the new businesses, the new industries. That’s not smart. But that’s the broken system we have today. Right now, our immigration system keeps families apart for years at a time. Even for folks who, technically, under the legal immigration system, should be eligible to become citizens but it is so long and so cumbersome, so byzantine, that families end up being separated for years. Because of a backlog in visas, people who come here legally — who are ready to give it their all to earn their place in America — end up waiting for years to join their loved ones here in the United States. It’s not right. But that’s the broken system we have today. Right now, our immigration system has no credible way of dealing with the 11 million men and women who are in this country illegally. And, yes, they broke the rules; they didn’t wait their turn. They shouldn’t be let off easy. They shouldn’t be allowed to game the system. But at the same time, the vast majority of these individuals aren’t looking for any trouble. They’re just looking to provide for their families, contribute to their communities. They’re our neighbors. We know their kids. Too often, they’re forced to do what they do in a shadow economy where shady employers can exploit them by paying less than the minimum wage, making them work without overtime, not giving them any benefits. That pushes down standards for all workers. It’s bad for everybody. Because all the businesses that do play by the rules, that hire people legally, that pay them fairly — they’re at a competitive disadvantage. American workers end up being at a competitive disadvantage. It’s not fair. But that’s the broken system that we have today. Now, over the past four years, we’ve tried to patch up some of the worst cracks in the system. We made border security a top priority. Today, we have twice as many border patrol agents as we did in 2004. We have more boots on the ground along our southern border than at any time in our history. And in part, by using technology more effectively, illegal crossings are near their lowest level in decades. We focused our enforcement efforts on criminals who are here illegally and who are endangering our communities. And today, deportation of criminals is at its highest level ever. And having put border security in place, having refocused on those who could do our communities harm, we also then took up the cause of the DREAMers, young people like Tolu who were brought to this country as children. We said that if you’re able to meet some basic criteria, like pursuing a higher education, then we’ll consider offering you the chance to come out of the shadows so you can continue to work here, and study here, and contribute to our communities legally. So my administration has done what we can on our own. And we’ve got members of my administration here who’ve done outstanding work over the past few years to try to close up some of the gaps that exist in the system. But the system is still broken. And to truly deal with this issue, Congress needs to act. And that moment is now. This week, the Senate will consider a common-sense, bipartisan bill that is the best chance we’ve had in years to fix our broken immigration system. It will build on what we’ve done and continue to strengthen our borders. It will make sure that businesses and workers are all playing by the same set of rules, and it includes tough penalties for those who don’t. It’s fair for middle-class families, by making sure that those who are brought into the system pay their fair share in taxes and for services. And it’s fair for those who try to immigrate legally by stopping those who try to skip the line. It’s the right thing to do. Number three, this bill would modernize the legal immigration system so that, alongside training American workers for the jobs of tomorrow, we’re also attracting the highly skilled entrepreneurs and engineers from around the world who will ultimately grow our economy. And this bill would help make sure that our people don’t have to wait years before their loved ones are able to join them here in America. So that’s what immigration reform looks like: Smarter enforcement; a pathway to earned citizenship; improvements to our legal system. They’re all common-sense steps. They’ve got bipartisan support. They’ve got the support of a broad cross-section of leaders from every walk of life. So there’s no reason Congress can’t get this done by the end of the summer. Remember, the process that led to this bill was open and inclusive. For months, the bipartisan Gang of Eight looked at every issue, reconciled competing ideas, built a compromise that works. Then the Judiciary Committee held numerous hearings. More than a hundred amendments were added, often with bipartisan support. The good news is every day that goes by, more and more Republicans and Democrats are coming out to support this common-sense immigration reform bill. And I’m sure the bill will go through a few more changes in the weeks to come. But this much is clear: If you genuinely believe we need to fix our broken immigration system, there’s no good reason to stand in the way of this bill. A lot of people — Democrats and Republicans — have done a lot of good work on this bill. So if you’re serious about actually fixing the system, then this is the vehicle to do it. If you’re not serious about it, if you think that a broken system is the best America can do, then I guess it might make sense to try to block it. But if you’re actually serious and sincere about fixing a broken system, this is the vehicle to do it. And now is the time to get it done. There is no good reason to play procedural games or engage in obstruction just to block the best chance we’ve had in years to address this problem in a way that’s fair to middle-class families, to business owners, to legal immigrants. And there’s no good reason to undo the progress we’ve already made — especially when it comes to extreme steps like stripping protections from DREAMers that my administration has provided, or asking law enforcement to treat them the same way they treat violent criminals. That’s not who we are. We owe it to America to do better. We owe it to the DREAMers to do better. We owe it to the young people like Tolu and Diego Sanchez, who’s with us here today. Where’s Diego? Right here. Diego came here from Argentina with his parents when he was just a kid, and growing up, America was his home. This is where he went to school. This is where he made friends. This is where he built a life. You ask Diego and he’ll tell you he feels American in every way — except one; on paper. In high school, Diego found out that he was undocumented. Think about that. With all the stuff you’re already dealing with in high school — (laughter) — and suddenly, oh, man, really? (Laughter.) So he had done everything right — stayed out of trouble, excelled in class, contributed to his community — feeling hopeful about his future, and suddenly he finds out he’s got to live in fear of deportation. Watching his friends get their licenses knowing he couldn’t get one himself. Seeing his classmates apply for summer jobs knowing he couldn’t do that either. So now he’s set his sights higher — master’s degree and then law school so he can pursue a career in public policy, help America shape its future. Why wouldn’t we want to do the right thing by Diego? What rationale is there out there that wouldn’t want to make sure Diego achieves his dreams? Because if he does, that helps us all achieve our dreams. So in the weeks to come, you’ll hear some opponents of immigration reform try to gin up fear and create division and spread the same old rumors and untruths that we’ve heard before. And when that happens, I want you to think about Tolu. I want you to think about Diego. And I want you to think about your own parents and your own grandparents and your own great grandparents, and all the men and women and children who came here. The notion that somehow those who came through Ellis Island had all their papers right — (laughter) — had checked every box and followed procedures as they were getting on that boat — they were looking for a better life just like these families. And they want to earn their way into the American story. And if you’re willing to stand with them — and if you’re willing to stand with all these outstanding leaders up here — then now is the time to make your voice heard. You need to call and email and tweet your senators and tell them, don’t kick this problem down the road. Come together. Work together. Do your job not only to fix a broken immigration system once and for all, but to leave something better for all the generations to come, to make sure we continue to be a nation of laws and a nation of immigrants. Do the right thing. Thanks. God bless you. God bless America.